The State is putting in a Budget Amendment for Youth Outreach Services’ program “Reducing Recidivism.” This is the result from meeting with Senator Colgan, Delegate Michael Futrell, and Delegate Lingamfelter in August, 2014. The Speaker of the House Delegate Bill Howell, Policy Director Virginia Reform Initiative gave Youth Outreach Services the opportunity to share its’ proposal for reducing recidivism through education, employment and rehabilitation (Transforming the ex-juvenile offender into an entrepreneur). It is an inclusive package with communities’ involvement, education and community services through the universities. If the budget amendment is approved, George Mason University will administrate the grant. DeMaine Jones, Personal Banker, Ryan M. Galloway, Legislature Assistance, Delegate Richard L. Anderson, Committee Chair: Science and Technology, Elizabeth Charity, CEO and Founder of Youth Outreach Services, James Doran ,GMU Intern, and Eugene Brown , Community Director of Youth Outreach Services. Building Infrastructures: The students and businesses will renovate an old house into a non-tradition career center in Prince William County and the college students, professionals, and their mentors will build a Social Entrepreneur Business Mentoring Center on the 3 acres of property, located at 4291 Prince William Parkway, Woodbridge, Virginia. Proven Statistics: The college students will provide method and analysis research case studies to prove that education is cheaper than incarceration. Developing Small businesses and Jobs therefore creating economic growth within the county. Impacting the Youth to become gainful employed and business owners. Providing an education and career path for all interested youth (14 years old- 24years old) who wants to become involved in social entrepreneurship and vocational training. Here are some of the highlights of Healing Our Communities Forum : Target will have a table to pass out refreshments and have individuals to sign up for seasonal jobs. Janice Yohai will pass out literature to assist individuals to restore voting rights. And Much Much Much More. Come and be a part of the movement ….. Healing Our Communities. Youth Outreach Services and Job Corps are discussing the possibility of partnering together to help provide job training and apprenticeship to at-risk teens ( 16 years to 24 years old) at the nontraditional career center located in Prince William County in Woodbridge, Virginia. Christina Letellier, Admissions Counselor, met with Elizabeth Charity, CEO and Founder of Youth Outreach Services to share what the Virginia Job Corps does to help students to enter into the workforce. You can learn more about the Job Corp by visiting their website at http://www.jobcorps.gov. Youth Outreach Services met with Mr. Kerry Bolognese, Director, Federal Relations, with the Office of Government and Community Relations at George Mason University to seek help, in obtaining Federal Funding to reduce recidivism. The funding will help operate and renovate YOS nontraditional Career Center. One of YOS goals is to transform ex-juvenile offenders to social entrepreneurs. As YOS move forward with the project, George Mason University Students are coming involved through GMU Social Entrepreneurship Society as they help YOS staff to do community service outreach. Tameka Casselle, YOS Grant Administrator/Manager and James Doran attended the meeting with Elizabeth Charity, CEO and Founder of the Company. James’ goal is to obtain a Master Degree in Social Work from George Mason University. Presently, he is volunteering his hours to Youth Outreach Services as he attends the University. Here in this picture he is shown with Mr. Angel Cabrera, President of George Mason University. Another one of YOS goals is to turn community services hours at the nontraditional career center into employment for Ex-Juvenile Offenders . YOS 12 weeks Job Readiness Mentor Program (JRMP) Youth Outreach Services has a proven track record that rehabilitation and mentoring help create entrepreneurs through intervention, prevention, after-care and employment programs. Implementing this program, we includes the private and public sector, the community and college students. Facts: Research shows that the U.S. prison population has grown exponentially within the past three decades. This amounts to close to $70 billion in annual expenditures related to adult and juvenile incarceration and the supervision of individuals who have been placed on probation and parole. In addition to these staggering numbers is the fact that, close to 75 percent of this spending is occurring on the state level (Hawkins). Statewide statistics show that, of those who reported their education level, approximately 29 percent of the incarcerated population, as of June 2012, possesses less than a 12th grade education (Statistical Analysis & Forecast Unit); while 44 percent possess a GED or high school diploma. Within the Central Region of Virginia, where Youth Outreach Services resides, of those who reported their education level, approximately 24 percent of offenders possess less than a high school education; while 25 percent possess a GED or high school diploma (Statistical Analysis & Forecast Unit). Of the individuals, who fall within the Central Regions area of responsibility, 92 percent are reported to be on parole or probation. The State of Virginia spends $12,000.00 for education (State by state, Census Bureau’s report on education finances), whereas it spends $24,667.00 for holding a prison in Virginia. It is estimated that annual corrections cost since 2000 have increased by a least $120 million beyond that expected given the state’s population growth. In FY 2008 Virginia taxpayers spent 7.6 percent of the state’s general funds on correction. Virginia has only 1 in 94 adults is under community supervision compared with the national average of 1 in 45. Combining these two statistics a high incarceration rate and a low community supervision rate-shows that 52 percent of Virginia’s adult correctional population is behind bars. Accordingly, this is the fourth highest rate in the country. VA is spending almost 20 times more per day to manage prison inmates than to supervise offenders in the community (www.rightoncrime.com/reforms-in-action). These figures do not include those incarcerated or on probation or parole supervision for misdemeanor offenses. Meet some of the individuals who have participated in YOS 12 week Job Readiness Mentor Program as a Mentor, College Intern, Executive Director, and a Juvenile Offender. I met Eduardo Ostos in the Juvenile Detention Center in Prince William County, Virginia. The prosecuting lawyer wanted to send Eduardo to the State Department of Juvenile Justice. Eduardo’s lawyer introduced Youth Outreach Services 12 weak Job Readiness Mentor Program to the Judge. The Judge ruled in favor of Eduardo participating in YOS program. Eduardo turned his life around. He received the Beat the Odds Award, did community service through YOS and receive a letter of achievement from the Honorable Congressman Gerald E. Connolly. Eddie Ostos, Congressman Gerald E. Connolly, Antoine Harris, YOS Chairman of the Board. Elizabeth Charity, CEO and Founder with the Honorable Judge Paul Gluchowski, Prince William County Juvenile and Domestic Court who court order Eddie to Youth Outreach Services Job Readiness Mentor Program. Travis is my son who has a passion for ministry, people, and knowledge. Travis Harris is an high achiever and has always been energetic about ministry and humanity. He became Youth Outreach Services’ first Executive Director at the age of 19 years old. At 14 years old, Travis had quite a portfolio; he helped to produce the local television program , “ Community Involvement Showcase,” in Richmond, Virginia , where he helped host a weekly television show. He also did radio broadcasting, where he and his friends talked about social issues which included black on black issues in the neighborhood; injustice and ministry in the community. During the summer while he was at the University of Virginia, Travis helped to develop the 12 week job readiness program and implemented it in Prince William Juvenile Detention Center. He graduated from University of Virginia with a Bachelor of Art Degree in Religion. He further his education with a Master Degree in Divinity from Virginia Union University and is now studying for this PhD in African America Studies at the University of William and Mary. Including in his list of many accomplishments, which is the most important to him is that he is a father to his two beautiful daughters Grace and Faith Harris and a devoted husband to his wife Destiney Harris. Raj Panth and Alan Boyce came as a pair. I was double blessed. Raj did the video production and Alan Boyce did the interviewing. Alan interviewed lawyers, authors, and businessman at our Fundraising event at Columbus Grill, 8349 Centreville Rd, Manassas, Virginia. Alan wants to be a television journalist and Youth Outreach Services job readiness mentor program gave him the opportunity to get on the job training in that field. We submitted some of our television productions to DC50-WDCW Channel 50 Television and it was accepted to be air. Youth Outreach Services could not afford the airing time on DC50-WDCW at that particular time. I met James Doran ( YOS intern and mentor) at the STAR Lab at George Mason University. We both were studying for spring examines. 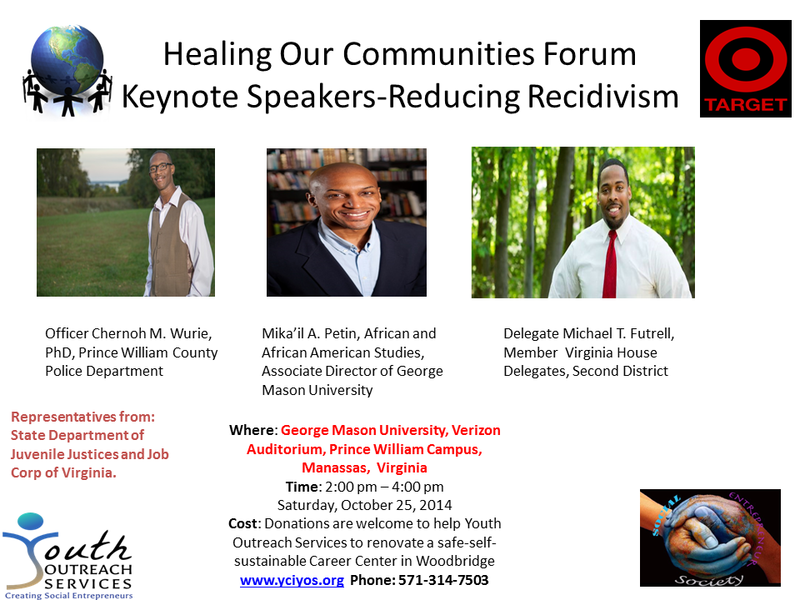 He sits down next to me and I began to share with him my BIS project on Reducing Recidivism. He volunteered immediately and said this is something he wants to help me with as a summer intern with Youth Outreach Services. James Doran is a Sociology Major and is working on his Master Degree in it with a Minor Degree in Public Policy. He wants to change some of the Public Policy laws especially those targeting juvenile recidivism. During his internship, he had the opportunity to meet Prince William County Board of Supervisor John Jenkins, Delegate Scott Lingamfelter of Prince William County, Delegate Michael Futrell, with Stafford and Prince William County, Senator Charles Colgan and Richard H.Buchholz, Gang Response Intervention Team (GRIT) Coordinator. He also helped to update the objectives and goals of the 12 week job readiness mentor program and revised YOS 5 weeks assessment program. Youth Outreach Services had the opportunity to introduce the re-entry program to Mr. William Stephens Regional Re-Entry Specialist from the Department of Juvenile Justice. He took time from his busy schedule to come to Prince William County and tour Youth Outreach Services Non-traditional Career center. Renovating the facility is therapeutically training, job training, business development, entrepreneurial training, and rehabilitation for the students involved. The Non-traditional Career Center is providing leadership, money management and career planning. Upon completion this facility, it will be a safe-self sustainable facility that offers employment, economic growth and education for the community. Your time and money invested will help build value in people lives and the community and help change Virginia statistics on recidivism which I shared with you earlier in the article. I am thanking you in advance for your time and consideration in this matter and making a donation to help make it happen. The Stars of the Great Big Gospel Car Wash were Giant Food, CiCi Pizza, Panera Bread, Target, George Mason University Social Entrepreneurship Society, the Rotary Club- Woodbridge, Virgina, and Dawn Massages, Youth Minister Aaron with Church On the Move in Woodbridge, Virginia, and a group of teenagers from Atlanta, Georgia with their Youth Minister, Thomas. The youth group came all the way from Atlanta Georgia to help Youth Outreach Services raise money for the renovation of the non-traditional career center. We only made a dent in the amount of money needed, but we had an awesome time reaching out in the community. Youth Outreach Services needs $150,000.00 to renovate the facility. Of course Youth Outreach Services Dream Team was there; Chris Archie, Antoine Harris, Frank Jones, James E. Doran and his daughter Katherine, Shaneika Nelson and Elizabeth Charity. If you believe God is putting it on your heart to give, please visit pay pal and give a donation. We are thanking you in advance for all that you do to help create entrepreneurs for the Kingdom of God. Youth Outreach Services Dream Team are creating entrepreneurs through empowerment, mentoring, training and apprenticeship . 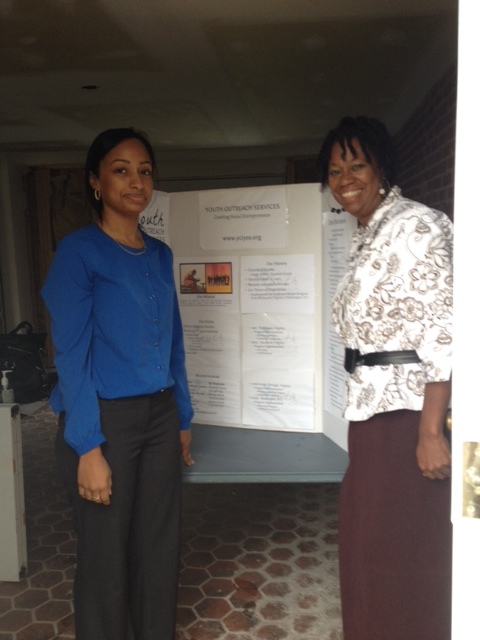 Youth Outreach Services is moving forward with the Summer program. Meet some of our candidates who has signed up to become entrepreneurs. Both, Dexter and Samuel are college students, who are receiving the benefits of Youth Outreach Services summer program. They are empowered, mentored, and trained to move forward and gain experiences and learn life teaching lessons that can change and redirect their lives. They are becoming leaders because they are being mentor and trained by leaders. Frank Jones is a mentor and counselor. He joined Youth Outreach Services dream team to bring about positive social changes. Youth Outreach Services Dream Team is partnering with the Rotary Club to help create social entrepreneurs. The Woodbridge Rotary Club is a group of professional men and women who have dedicated and committed their lives to educate and to improve the lives of our youth; especially the at-risk teens and young adults who need directions and guidance to moving forward on a career path. As the CEO and Founder of Youth Outreach Services, I am so happy to become a member of Woodbridge Rotary Club. We are expecting to do great things in the Woodbridge Community, in the school system and helping to reduce recidivism in the state of Virginia by providing positive role models and mentors to our youth. So stay tune as Youth Outreach Services’ Dream Team and the Rotary Club join forces together to make positive things happen and brings about positive social changes through Youth Outreach Services Nontraditional Career Center on 4291 Prince William Parkway, Woodbridge, Virginia and eventually global. Youth Outreach Services is partnering with Church on the Move, George Mason University Social Entrepreneurship Society and other youth groups to have the Great Big Gospel Car Wash on the property of YOS Non-traditional Career Center on July 25, 2014 from 9:00 am – 6:00 pm at 4291 Prince William Parkway. We are taking this opportunity to educate the community on reducing recidivism and to turn community services into employment and a career path. 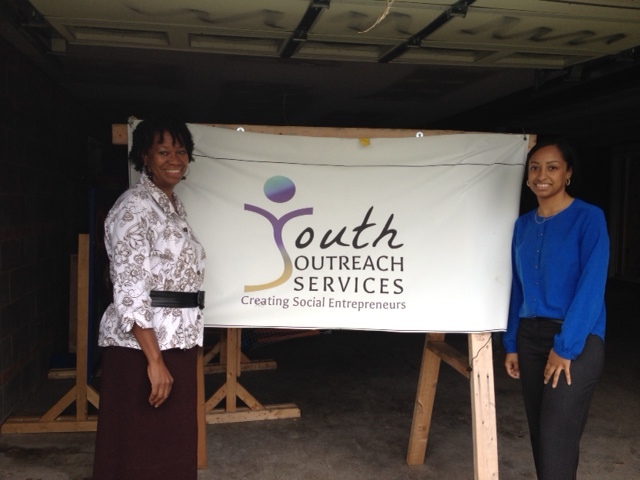 Youth Outreach Services is renovating the facility to implement 6 incubator businesses in it. One of the businesses is Crown Jewel Detailers, the auto detailing businesses. To kick-off the business, Youth Outreach Services is inviting businesses, organizations, and ministries to come and set up a table for $75.00 or bring 3 cars to wash and vacuum at $30.00 per car. There will be food, games, singing and ministry – all we need is your involvement with the community!